Palestinians have rejected the Israeli prime minister's conditions for a two-state solution, saying he has "paralysed" the peace process. 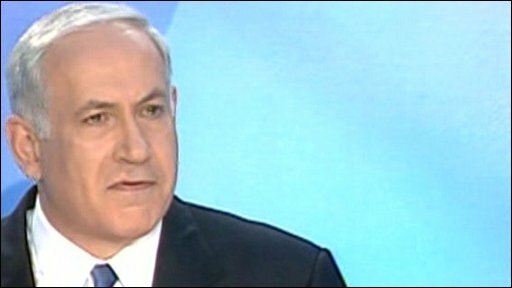 Israeli Prime Minister Benjamin Netanyahu, in a major policy speech, accepted the creation of a Palestinian state but only if it was demilitarised. Palestinian leader Mahmoud Abbas's spokesman said his comments challenged Palestinian, Arab and US positions. But the US said Mr Netanyahu's stance was an "important step forward". In a landmark speech, weeks after US President Barack Obama urged him to agree a two-state plan, Mr Netanyahu said the Palestinians must accept Israel as a Jewish state. He said a Palestinian state must have no army, no control of its air space and no way of smuggling in weapons. His speech provoked anger among Palestinian officials. Mr Abbas's spokesman Nabil Abu Rdainah said: "Netanyahu's remarks have sabotaged all initiatives, paralysed all efforts being made and challenges the Palestinian, Arab and American positions," Reuters news agency reported. Palestinian negotiator Saeb Erekat said the speech "closed the door to permanent status negotiations". "We ask the world not to be fooled by his use of the term Palestinian state because he qualified it. "He declared Jerusalem the capital of Israel, said refugees would not be negotiated and that settlements would remain." Benjamin Netanyahu has shifted. He has used the word "state", when it comes to Palestinian self-rule. In another deeper sense, though, there has been no shift. Mr Netanyahu's closest aides have been saying for months that they have two over-arching pre-conditions: a public Palestinian acceptance of Israel as the nation-state of the Jewish people, and a complete demilitarisation of any future Palestinian entity. And Mr Netanyahu tersely dismissed the US call for an end to settlement expansion: these people have to live, he said. He described them as "pioneers" and "principled". This is a speech which will shore up the prime minister's position within his right-wing coalition. It is, whatever you think of the rights and wrongs of it, a powerful forehand deep into the back court of the Americans. It will be fascinating to see when and how the Americans return the ball. Mr Erekat added: "The peace process has been moving at the speed of a tortoise. Tonight, Netanyahu has flipped it over on its back." In Gaza, Hamas spokesman Sami Abu Zuhri described the speech as "racist" and called on Arab nations to "form stronger opposition" towards Israel. But the White House called the policy outline an "important step forward", as did French Foreign Minister Bernard Kouchner. A White House statement said Mr Obama "believes this solution can and must ensure both Israel's security and the fulfilment of the Palestinians' legitimate aspirations for a viable state, and he welcomes Prime Minister Netanyahu's endorsement of that goal". The BBC's Sarah Morris in Washington says Mr Netanyahu's comments have provided a lot of encouragement to the White House, but it is uncertain whether they will be enough given the Israeli prime minister's refusal to budge on the issue of Jewish settlements. The statement made no mention of Mr Netanyahu's demilitarisation caveat. A potential stumbling block in any future peace deal - that of settlements - also went unmentioned in the statement, our correspondent adds. In his own keynote Middle East speech in Cairo on 4 June, Mr Obama stressed that he wanted all settlement activity to stop. But Mr Netanyahu said settlers were not "enemies of peace" and did not move from his position of backing "natural growth" in existing settlements. Former US President Jimmy Carter warned that the US and Israeli governments would be on a "collision course" if Israeli settlement activity continued in the West Bank. The settlers group Yesha condemned Mr Netanyahu's speech: "We deplore that the prime minister has agreed to the creation of a demilitarised Palestinian state after he has said for years that such a state, even demilitarised, would be a threat to Israel."